Are you looking for accommodation in Broadbeach for your holiday on the Gold Coast that has a great beachfront location yet is affordable and spacious? The Sandpiper Beachfront Apartments are excellent value for money Gold Coast accommodation. Our fully self contained 1 and 2 bedroom apartments are ideal for couples or small families looking for economical accommodation by the sea. 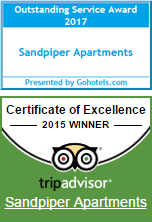 The Sandpiper Beachfront Apartments have everything you need for your home away from home. There’s a fully equipped kitchen ready for you with a full-sized fridge, microwave and dishwasher. Long stays are easy too with full laundry facilities in each apartment. Most apartments have picturesque views overlooking park lands and the Pacific Ocean beyond. At just fifty metres to the beach on Kurrawa, you’ll be virtually living on the beach. This stretch of beach is also surf patrolled so you can be assured of a safe swim as long as you swim between the flags. This is the perfect family holiday destination with access to the Gold Coast theme parks so easy. Get on on the Smith Street Motorway and head west until it meets with the Pacific Motorway to get to Oxenford. It usually takes twenty minutes to get there. Once you find your way the first time (maybe Movie World), the route will be sure to become quite familiar. Don’t forget Main Beach. One of the world’s largest underwater aquariums that you can walk under, Sea World is there. (If you don’t start there, you’ll probably finish your theme park tour there). If you want to take it easy, you can enjoy the park lands of Kurrawa Park and Pratten Park. There you’ll find an array of public amenity that you seldom see all in one handy location. Public BBQs, covered children’s playgrounds and play areas, walking and cycling pathways, toilets and changing facilities are all there. The best things in life really are free. You’ve come to the right place for accommodation in Broadbeach on the Gold Coast. The Sandpiper Beachfront Apartments is your ticket to holiday central, the Gold Coast. Book now.